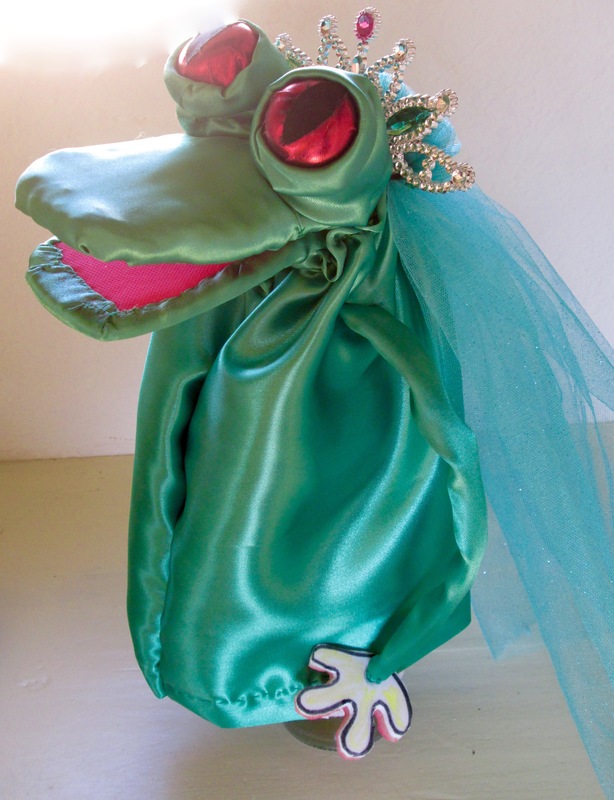 Who knew that Kermit came from royalty? 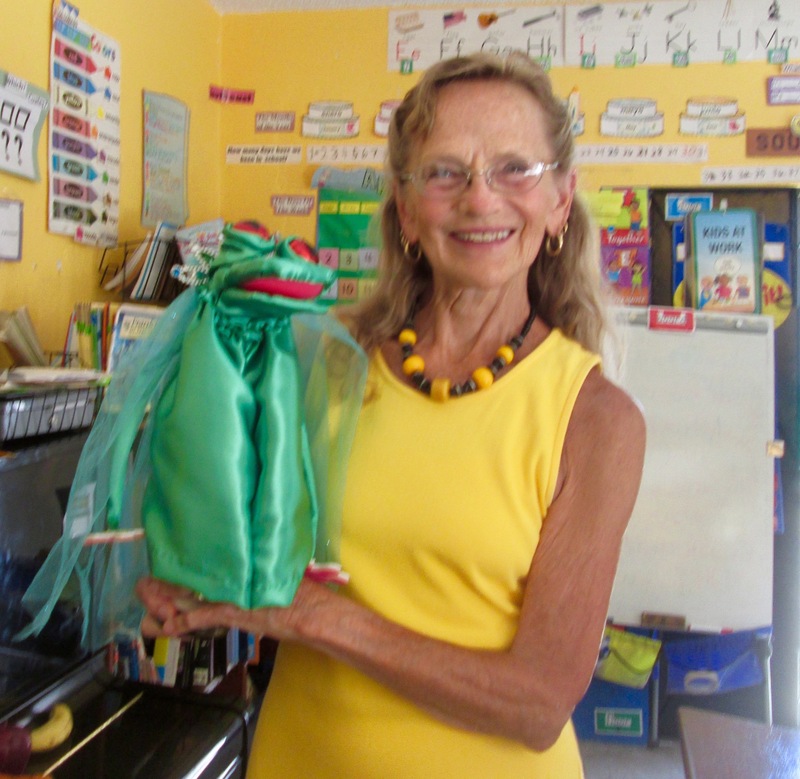 Just this week Kermit’s old auntie Rana, who is una reina (a queen) appeared on the scene (actually, I conjured her) and made her dramatic debut for the children of Aprendizaje del Ingles, where I do volunteer teaching on Wednesday afternoons here in San Miguel de Allende. being the color of the leaves on the trees. gold – like a star! But, green is the color of spring! or delicious, like an avocado! and it is what I want to be. 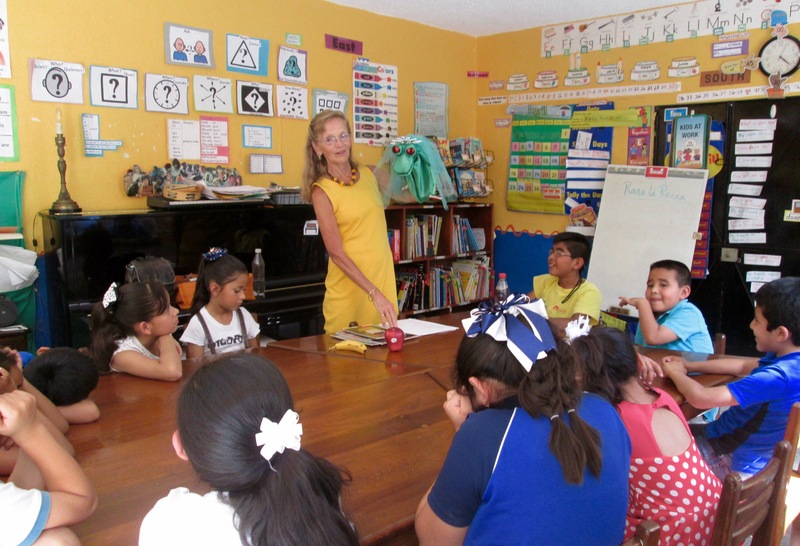 Phrase by phrase, the kids attempted to learn the words to Rana’s song in English, aided by the real-life props – an apple, a banana, and an avocado. On the back of their activity sheets, they each drew Rana’s picture and colored her in – green, of course, with big red eyes. They seemed to enjoy her. One little boy, Antonio, who is particularly affectionate, wanted Rana to kiss him again and again, on the lips, which just goes to show that even old frogs can be attractive. Not so long ago, a new friend here, Kathleen, from Canada, asked me which of my former careers I’d enjoyed the most – writing, catering, or teaching. I had to think a minute. Finally, I said I loved all of them, in different ways, at different times, for different reasons. But thinking more deeply now, I’d say they were (are?) all of a piece: Whether it’s preparing a lesson to teach (be it to little Mexican kids or American college students), or writing an essay (or book, or blog post), or cooking a meal for clients or guests, I’ve felt I was creating something for others’ consumption – feeding them in different ways, in other words. The goal for me has always been, and I guess still is, to strive to make whatever I make as nourishing and delicious as an avocado.